The Ministry of Internal Affairs and Communications (総務省, Sōmu-shō) is a cabinet-level ministry in the Government of Japan. Its English name was Ministry of Public Management, Home Affairs, Posts and Telecommunications (MPHPT) prior to 2004. 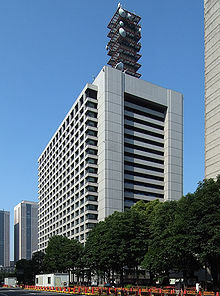 It is housed in the 2nd Building of the Central Common Government Office at 2-1-2 Kasumigaseki in Chiyoda, Tokyo, Japan. The Ministry oversees the Japanese administrative system, manages local governments, elections, telecommunication, post, and governmental statistics. The Minister for Internal Affairs and Communications (総務大臣, Sōmu Daijin) is appointed from among the members of the cabinet. The Ministry was created on January 6, 2001, by the merger of the Ministry of Home Affairs (自治省), the Ministry of Posts and Telecommunications (郵政省, MPT) and the Management and Coordination Agency (総務庁). Certain functions of the Management and Coordination Agency were transferred to the Cabinet Office in this process, while many functions of the MPT were transferred to an independent Postal Services Agency which later became Japan Post. ^ "Ministry of Internal Affairs and Communications External Agencies". soumu.go.jp. Retrieved 11 April 2018.